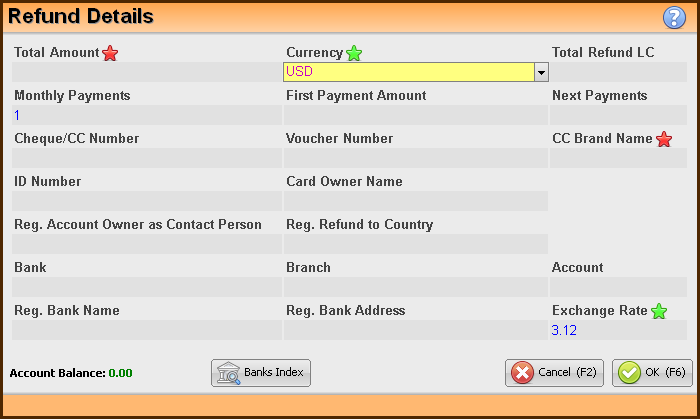 This window allows to enter C.C Clearing Confirmation, by manually entering the credit card details of the client. In order to approve this kind of refund, fill in the credit card details, monthly payments, the owner details and the account details (The bank details of the account can be automatically filled by using the Bank Index button). The system also requires a Cheque/CC Number as well as Voucher number and C.C Brand Name. Please pay attention to fill in all of the required details in this window. When updating the monthly payment field, the "First Payment Amount" field will be automatically filled and can be modified. The rest of the amount will be equally divided between the following payments.